In general, the 2018 models have good low input lag and fast response times and accept various input signals, which is excellent for gaming. Exciting gaming features like Variable Refresh Rate, optional Motion Interpolation with low input lag, or optional Black Frame Insertion are present in more and more of the 2018 models. 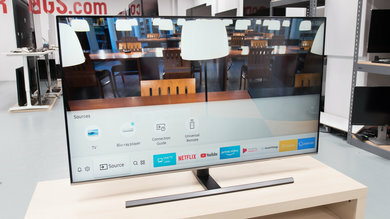 We've tested 80 TVs and below are our recommendations for the best gaming TVs you can buy in 2019. Check also our recommendations for the best gaming monitors and the best gaming headsets. The LG OLED B8 is the best gaming TV that we've tested so far. It has a nearly instantaneous response time, delivering crystal clear motion with no blur trail behind fast moving objects. It also has excellent low input lag, ensuring a responsive gaming experience. The B8 delivers outstanding picture quality, with perfect blacks, wide viewing angles, and an excellent wide color gamut. It has outstanding reflections handling and good peak brightness, making it a versatile TV that looks great in any setting. Unfortunately, like all OLED TVs, there is a possibility of temporary image retention or even permanent burn-in on the B8. This can be a concern, as most games have at least some static elements. With mixed usage though, we don't expect this to be an issue for most people. 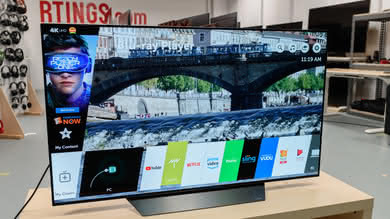 Overall, the LG OLED B8 is an excellent 4k TV that should please even the most competitive gamers. If the possibility of burn-in with the LG B8 concerns you, the Vizio P Series Quantum is the best 4k LED gaming TV that we've tested so far. It has an extremely fast response time and low input lag, ensuring clear motion and a responsive gaming experience. 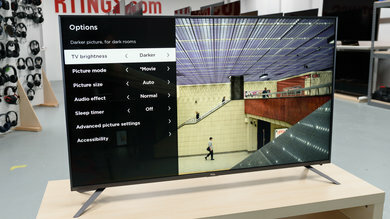 Although it doesn't have the infinite blacks or wide viewing angles of the OLED TVs, the P Series Quantum delivers great picture quality, thanks to an excellent contrast ratio, outstanding wide color gamut, and great color volume. Overall, the P Series Quantum is an excellent gaming TV that should please most people. If the Vizio P Series Quantum is too expensive, then the best mid-range gaming TV we've tested is the Vizio P Series 2018. Just like the PQ65-F1, you might have a hard time finding the P Series 2018, so you can always check the mid-range alternatives that are almost as good. 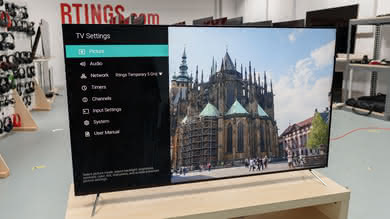 The Vizio P series 2018, just like the P Series Quantum, has a VA panel that is immune to burn-in but, unfortunately, it cannot get as bright as the PQ65-F1 nor does it have the smart features of the LG B8. However, it allows you to cast your content from most smart devices. On the upside, the P Series 2018 is an excellent gaming TV with great picture quality with deep blacks for a dark room, excellent response time, and very low input lag that makes it very responsive. As far as gaming, the P Series 2018 performs just as good as much more expensive high-end models like the Sony A9F. Overall, the Vizio P Series 2018 will not only please gamers but will also deliver an excellent performance in most other uses. 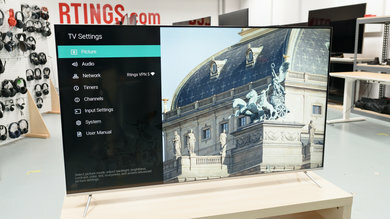 If you expect that you will be experiencing tearing issues that the Vizio P Series 2018 can't deal with, then get the Samsung NU8000. It does not have the great blacks of the Vizio, since the local dimming isn't as effective. 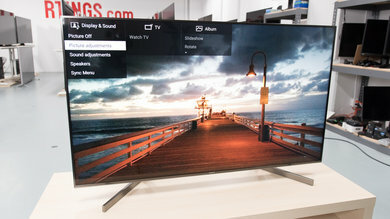 On the upside, the Samsung NU8000 is a TV with very good picture quality and great motion handling. It has an excellent low input lag both in SDR and in HDR and supports FreeSync Variable Refresh Rate, so you can enjoy your favorite game free from tearing. If you plan on mainly gaming on a recent 4k console such as the PS4 Pro or the Xbox One S/X and want to get the best HDR experience, the Sony X900F is the best mid-range alternative to the Vizio P Series 2018 for HDR gaming. The X900F has slightly worse input lag than the P Series for non-4k gaming, but in HDR it is a bit better and has the same excellent motion handling. It is also brighter and produces brighter small highlights in HDR. If the Vizio P Series 2018 is too expensive, the best budget gaming TV is the TCL 6 Series 2018 R617. It is the successor to the extremely popular TCL P607. It has excellent low input lag and it produces very similar picture quality to the Vizio, but it is a bit brighter in both SDR and HDR. Unfortunately, fast moving objects have a bit more motion trail. The design of the R617 isn't as polished as the P Series, and the interface isn't as fancy, but most people will find the smart features of the TCL to be more advanced. Overall, the TCL R617 offers a great gaming experience at a low price, and it is a versatile choice that should please most people. If the TCL R617 is still too expensive for you, the Series S405/S425, also by TCL, is an even cheaper alternative if you can still find it. 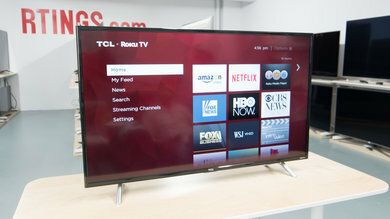 The TCL S425 is the same TV with some cosmetic upgrades. It lacks many of the more advanced features found on its more expensive siblings, but still provides a decent viewing experience. It has very similar motion handling to the R617 and has even better low input lag. 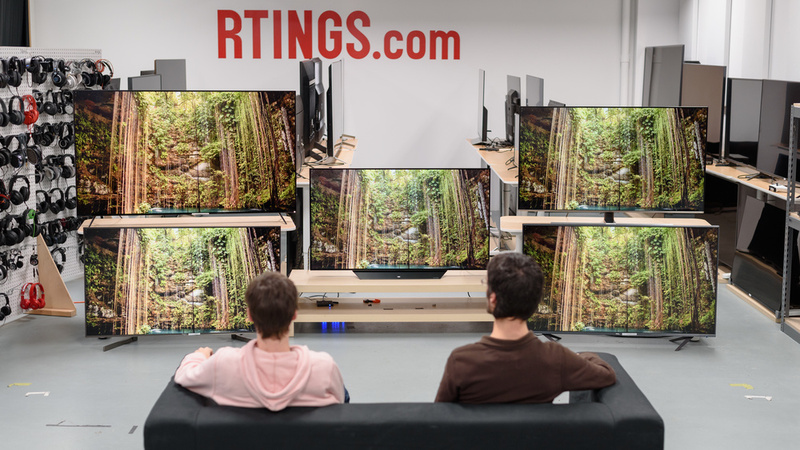 Our recommendations are based on what we think are the best gaming TVs currently available. They are adapted to be valid for most people, in each price range. Rating is based on our review, factoring in price and feedback from our visitors. If you would prefer the make your own decision, here is the list of all of our TV reviews. Be careful not to get too caught up in the details. Most TVs are good enough to please most people, and the things we fault TVs on are often not noticeable unless you really look for them.